In every small town in Ireland there exists the pub, short for public house. Pubs are the social backbone to a neighborhood and home to good company, good conversation and good food and drink. Welcome friends new and old, to your true neighborhood public house in the heart of historic Roswell. 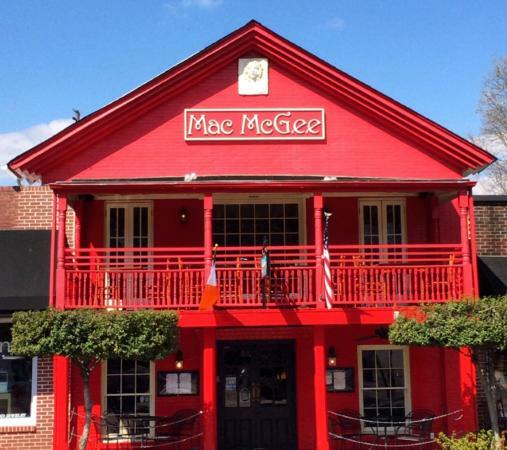 Shake off the winter chill at Mac McGee’s, whose second location opened in March of 2013, on Canton Street in historic downtown Roswell. This pub seemingly transports you to Ireland with ornate woodwork, rich stained glass and even numbered pews that were rescued from a church fire. All of these décor details were imported directly from Ireland during the owner’s numerous trips to the emerald isle. Whether you chose to whet your whistle and unwind with a drink from their extensive beer or whiskey selections, or choose from the expanded craft cocktail list, you will not be disappointed. The bar features 32 beers on tap, 28 in a bottle, 150 + whiskeys plus specially designed craft cocktails. Cheer on your favorite Irish and European sports matches at the bar on the big screen or duck into a “snug” for a more intimate seat. These decorative wooded booths are partially enclosed in keeping with the historical tradition of hiding away priests and women who frequented olde pubs to drink discretely. In true Irish pub fashion, you will be delighted with the tastes and smells from the made-from-scratch kitchen. Executive Chef Larry Powers operated a gastro pub in Ireland for three years and brings a wealth of menu choices that are sure to please every taste bud! Mac McGee’s also offers great catering options, a large space for entertaining big parties, as well as small nooks for more intimate gatherings with two full floors and an outdoor second floor porch. Live music is played every Thursday, Friday and Saturday nights. Check their Facebook and Instagram pages for special events, tastings and parties. Find them on Facebook at “Mac Mcgees – Historic Roswell”, on Instagram at “macmcgeepub” and online at macmcgeeirishpub.com . Address and hours are: 936 Canton St, Roswell Square, Roswell, GA 30076, Sunday-Wednesday 11:30am-12:00pm and Thursday-Saturday 11:30am-2:00am.